NO SOONER do you think the elections are over and the madness will finally subside, than along comes SACP chairman Senzeni Zokwana. Yes, this worker champion, who has now been elevated to agriculture & fisheries minister by President Jacob Zuma, is also the immediate past president of the NUM. He pays his cattle herder the princely sum of R26 a day. Yes, dear, that’s R26 a day. And the herder is on duty on Saturdays and Sundays, too. Zokwana is the same guy, mind you, who every second day rails against business and its poor wage increases. Watch this space. Before you can say “promotion” this minister will be on the ANC committee that is investigating the introduction of a basic minimum wage across the country. Before you can say “red tape” there will be a law introducing a basic minimum wage in SA. And before you can say “hypocrisy” you will find that our dear Zokwana is still paying his herder R26 a day. After all, the SACP did come out guns blazing when the story was published, saying that newspapers were being “petty”. No-one said a word about the fact that Zokwana has been enjoying an annual salary of R1m since he became NUM president 14 years ago. I really am not surprised that Zuma arrived at an ANC national executive committee meeting on Friday looking ragged and had to be sent away by party secretary-general Gwede Mantashe. Then, on Saturday, it was announced that Zuma was admitted to a Pretoria hospital. I don’t blame the guy for being so stressed. With the Zokwanas of this world in your cabinet you would also need a rest. And the election was exhausting too, according to Mantashe. “I must say these elections were quite punishing. I was told to go and sleep for nine days. I slept for nine days,” says Mantashe. We all need a holiday after that election campaign and the appointment of the Zokwanas of this world. Which is why it was such a pleasure to hop onto a Federal Air flight to Inyati Game Reserve out in the Sabi Sands, Mpumalanga, the other day. Like Mantashe and Zuma, I needed a break from the madding crowd. Here is the thing about the bush. The minute you enter those small planes, or drive out of the city, the tension just flows out of you. There are no fences between Inyati and the other lodges in the Sabi Sands. The animals roam free. And there are plenty of them: on my first game drive we saw a leopard with two cubs, two herds of elephant and a testosterone of three male lions who were having their afternoon nap.Ask your game ranger not to park downwind from them: they let rip so often we had to either move on or die of asphyxiation. There are three things you need to remember if you ever go to Inyati. First, the barman, Levi, is phenomenal. Second, the view from the reception area could make an Ernest Hemingway out of a pedestrian writer such as me. There is nothing like sipping a gin and tonic, writing your piece, and seeing animals come down to the river and have a drink. Or a leopard passing through the premises. Third, try to make sure you have a meal out in the bush on one of the days you are there. The staff build a huge fire, a bar is set up and a braai is laid on. The pap is phenomenal, the drinks flow, the stars are fiercely out in the night sky, the meat is delicious and all is good with the world. And I managed to put in a solid nine hours’ sleep, resting just like my hero, Mantashe. Divine. 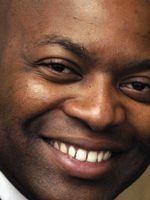 Justice Malala is a weekly columnist for the Financial Mail.